Cologne - On a particularly emotionally-charged day in the Bundesliga, it's hard to decide which came as more of a surprise: Hannover 96's 2-1 win at FC Augsburg or SC Freiburg's victory over champions FC Bayern München by the same scoreline. Either way, along with VfB Stuttgart following a similarly rousing 2-1 success against Hamburger SV, they were the big winners on Matchday 33. For Hannover, Saturday's victory against an Augsburg side jostling for a place in the UEFA Europa League had been a long time coming - 16 games in the making in fact. 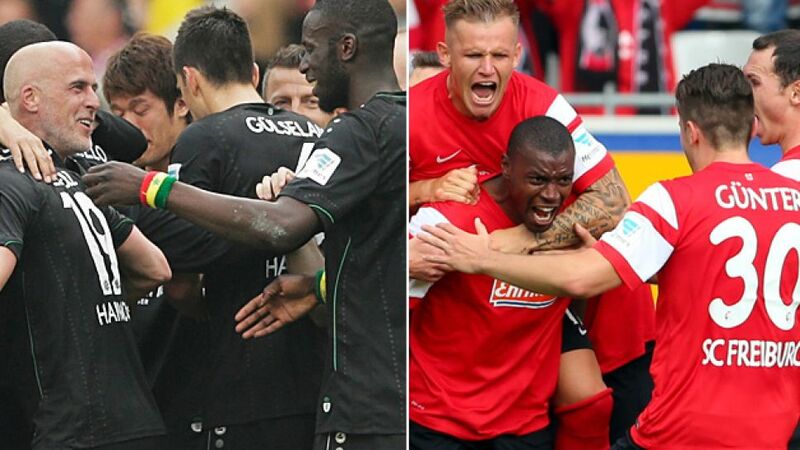 Had they lost, the Reds would have gone into the final weekend level on 31 points with bottom side SC Paderborn 07. Instead, stationed outside the relegation zone in 15th with one game left to play, survival is now theirs for the taking. "It feels great," admitted a somewhat relieved Leon Andreasen after helping the 96ers to their first league win since, funnily enough, beating Augsburg on 16 December 2014. "We came here looking to get something from the game. I don't think we expected three points, so we're even more delighted [...] We've waited so long for a win and finally we've got it. I'd forgotten what it was like to win." Andreasen's recollection of back-to-back victories is likely to be vaguer still. The Reds haven't managed to record successive wins since November of last year, but they'll have to put an end to that measly run if they want to avoid a nail-biting finale to the 2014/15 campaign. Depending on how the bottom three fare, anything other than three points at home to Freiburg could send the Lower Saxons down. For the 14th-in-the-table Breisgauer - fresh from their maiden league win over Bayern - the outlook is a shade more favourable. Even if 17th-placed Hamburg and relegation play-off incumbents Stuttgart are victorious on the final day, Christian Streich's men cannot be relegated as long as they avoid defeat at the HDI Arena - unless HSV win by 18 clear goals against FC Schalke 04. A win would, of course, make their life a whole lot easier. "We've got one more game next week, and we have to put up a fight just like we did [against Bayern]," explained Freiburg forward Felix Klaus. "We want to give our absolute all once more and secure our top-flight status. It's a final for us. We've got a week to prepare. Everyone knows what it's about. Hopefully we can do it." Unsurprisingly, Hannover captain Lars Stindl adopted a like-minded stance after scoring both goals against Augsburg, saying: "Everything will be decided next week. We've got ourselves in a really good position going into the final game. We've made sure it's in our own hands. We want to make sure we stay up."